Enjoy penthouse views of the fabulous blue waters of the Atlantic and Florida Bay-- all from the comfort of your own two bedroom, two bath condo. This condo sleeps 4 adults (+ small child ) comfortably and features an updated kitchen with every convenience you might require. The master bedroom has a king size bed, bath and walk-in closet. The second bedroom has a queen bed and attached bath with shower. Our NEW heated swimming pool with Tiki Bar, lighted tennis courts as well as plenty of beautifully landscaped property for walking are all available within this safe gated community. Relax seaside at our sandy beach and view the fabulous sunsets every evening from our penthouse balcony. For you boaters, Futura Yacht Club offers the best deep water dockage and on site boat ramp in the area. There is even storage for your boat trailer at no extra charge. Islamorada is known as the Sportfishing capital of the World for good reason. Futura Yacht Club is on Florida Bay and some phenominal backcountry fishing. We are within minutes of the best deep sea fishing you can find anywhere. If you need a charter we can hook you up with one of the fastest boats and best captains in the area. Families, boaters, fisherman and diving enthusiasts cannot find a better vacation location than our Futura Yacht Club Penthouse!! My husband and myself purchased this fantastic condo because of the view and the location. Although we usually only get to enjoy our condo once a year we absolutely love being there and sitting on our balcony looking out over the water. When we are not there we want to share our little bit of paradise with others. Futura Yacht Club is a small gated community so it is easy to meet new people. We are fortunate to have a 'keys beach looking over the expansive waters of Florida Bay. It is close to many wonderful restaurants and activities. It felt like we were in a tropical island far away yet in the USofA! Our gated community is one of the few to have onsite boat launch, onsite and amply trailer parking and designated boat slips with water at dockside. All this for a small weekly charge if you wish to bring your boat. Full appliances including dishwasher, stove, oven micro and all you would need to "eat in." Breathtaking views and an outstanding location! Fabulous condo! An awesome location! The condo and community have everything you need to have a great family vacation! Incredible views, tennis, basketball, outstanding pool and more views of the water than you can imagine. This is an outstanding location! 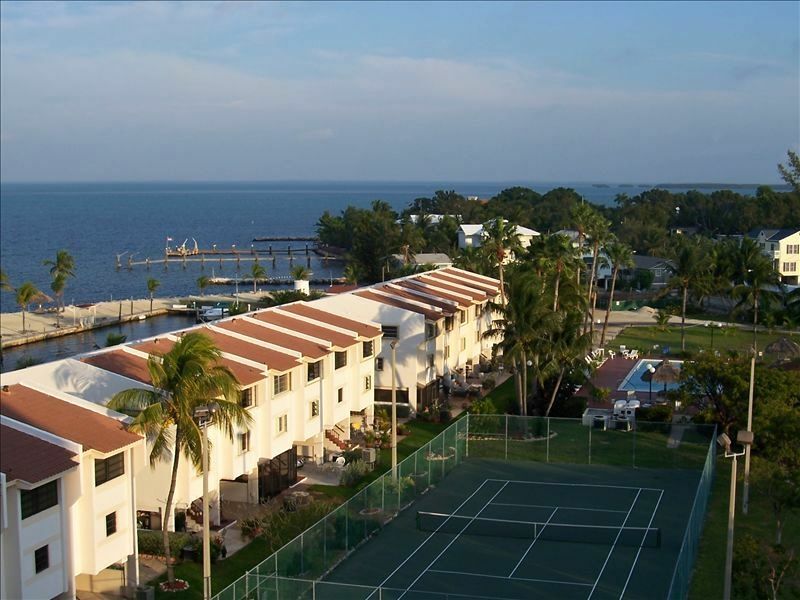 As a bonus you can take your rental agreement to the Islamorada Founders club and enjoy access to their beach and Olympic size pool with diving boards. And don’t forget the incredible fishing!!!!!! Can’t say enough about this Vacation spot and Stephanie’s service. A true jewel in the keys! Thank you Bob. We love to have great people like you at Futura! Please come back. Nice condo with great views! Had a wonderful, relaxing stay. So love the Keys! Condo had a lot to offer plus close to restaurants, etc. Love the pool, marina and gardens of the property. Bayside is the best place ever to see the sunset! Thank you Katren. We are so happy that you enjoyed our bit of Keys Paradise. Hope you return. Thank you Carol. It was great having you at our little piece of paradise. We hope you can return! My husband and I spent ten lovely days at Stephanie's gorgeous two bedroom condo in late November 2018. Everything was spotless,and the beds and the furniture were all comfy. The kitchen was amazing with real china, everything you need for cooking, lovely wine glasses etc. We never heard any of our neighbors which we thought was fantastic. Beauty and Peace. The outdoor pool is awesome if you are a swimmer. It is huge and also nice and warm. Wow. I enjoyed walking down to the marina to see the water, boats, manatees and the fishermen there. Everyone we met at Futura was really nice! We loved our stay and will come again! Thanks for a great vacation rental, Stephanie! Thank you Gretchen. We love our bit of Paradise and glad you did too. Please return. Very clean. Had everything you need for vacation! Thank you. We do have a bit of Paradise! Very good venue. The pool was our favorite place. Good position to enjoy the Keys. Felt safe and comfortable. The premises were well kept with good facilities and lovely sea views. Low Season rates offered during September- mid December. Email for last minute rate specials Boat Slip available for $150 per week Second payment must be made to the owner after signing the Rental Agreement which will be sent via email once renter makes deposit.